Irwin Weiner ASID - It's the most popular time of the year for weddings, and because stylish decor is such an important part of making weddings and family events unique, reflecting the couple/hosts' personalities, Design2Share interviewed popular wedding planner and stylist Katie Berger of Sarah Kate Events, New York City. I asked Katie to pick a few decor items that would help make a wedding extra special. 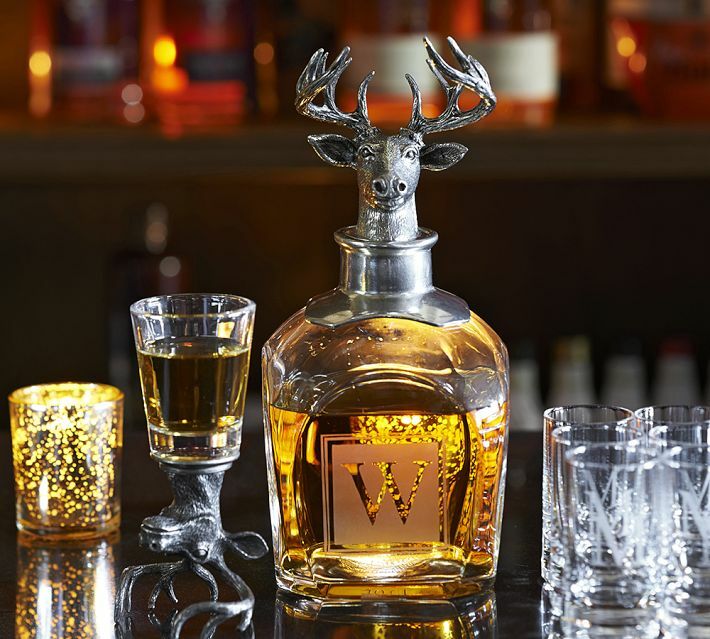 The Stag Decanter (top photo) really speaks to me. It must be my West Virginia roots, but I adore this. I would love to see this sitting in a cordial bar are paired with the companion Bear and Moose decanters. It would be an unexpected addition to the bar area. Of course you could also use this in your home ... and I may be ordering this for myself! The Antique Silver Serve Bowl (three photos, above) would be an amazing addition to a family-style dinner service for a wedding reception, and then used at your own Thanksgiving, Christmas, and family parties. Look at how versatile the piece is, too: use it for fruit and salad and other food dishes, use it to anchor a beautiful flower arrangement, or use it as an ice bucket or to cool down water, wine, and vodka. The inscription reads: "Together with friends and family is always the happiest place to be." I rest my case. I love the simplicity of the Bacchus Glass Table and Bedside Lamp (above). I would use this on a table beside a guest book. Have some beautiful paper - perhaps light blue and a few pens with great ink; navy blue, not black - and have guests write a note to the bride and groom and then gather tham all and place them inside the base of the lamp. It will constantly remind the couple of the love that they have for each other and the love of their family and friends. It all ties back into the idea of bringing people more actively into the wedding and the couple's life afterwards. I'm drawn to the pattern on the Roz Tile Table Runner (above). It would be great on the cake table, with the couple's monogram. It's modern, but the monogramming adds a touch of the traditional. The Zigzag Floor Pouf (above) is fantastic! It would be perfect for a cozy nook in the reception space for guests to sit on and have a drink while chatting with old friends. I'd use it in a heartbeat for a more modern wedding, perhaps in an industrial loft space. Last, but certainly not least, I love these Mother-of-Pearl Boxes (above)! They're gorgeous, and I'm totally wanting them for my own home. I would use them as a card box or as a cookie display for a dessert table; when the wedding was over, you'd have a beautiful keepsake box. The color is lovely, and it would work well with many wedding palettes, such as blush, gold, and silver. The boxes would work well in either a traditional or a modern wedding scheme - they're that versatile. Design Favorites: What's Not to Love?